EIX Logistics is a non asset Logistics Provider, providing Air & Truck transportation services to Military and commercial shippers across the United States. 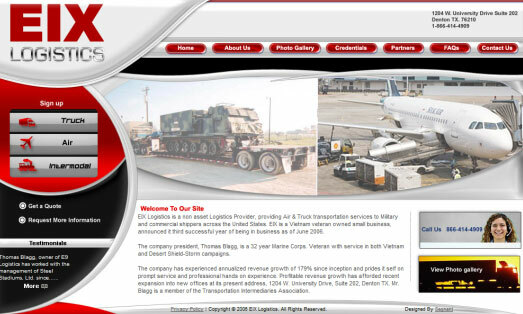 EIX is a Vietnam veteran owned small business, announced it third successful year of being in business as of June 2006. 1. Photo Gallery: This section displays photos organized by categories of the various vehicles used. 2. Credentials: This page features the awards and credentials earned by the company and its owner. 3. Partners: This site provides information and links to partner companies. 4. Sign Up Forms: This section provides online forms to sign up for Truck, Air, and Intermodal services. Segnant provided EIX Logistics an animated logo and a stylish website to make it easier for users find information about the company, request more information, and sign up for services.